Meet the needs of acne-prone skin with the Avène Cleanance Solutions: Blemish Control Regimen; a complete skincare regime that works to tackle spots and blemishes. With regular use, the four-piece collection delivers a visibly clearer complexion and long lasting results. Purify the body and the complexion with the Cleanance Cleansing Gel; an effective face and body wash that is ideal for acne-prone skin. Utilizing gentle Surfactants, the potent gel provides a thorough clean, whilst a dose of Monolaurin is able to reduce excess oil to leave skin shine-free. Complete with a soothing blend of Zinc Gluconate and Avène Thermal Spring Water, the cleanser is able to calm irritation and redness to leave skin comfortably cleansed. Target blemishes with Cleanance Expert; an award-winning spot cream that combats blemishes at every stage. Ideal for those with oily skin, the potent formula works to regulate sebum production and discourage the appearance of new blemishes. Gentle exfoliating action works to visibly smooth skin, as well as reducing the appearance of stubborn blackheads. Redness and inflammation are also visibly eliminated. Complete with a dose of Shea Butter, the targeted formula leaves skin feeling comforted and nourished. Purify pores with the Cleanance MAT Mattifying Toner; a potent bi-phase solution that tightens the pores without causing irritation. Utilising Monolaurin, the toner reduces excess oil produced by skin to leave the complexion matte and shine-free. Complete with a healthy dose of Thermal Spring Water, the toner leaves skin feeling calm, soothed and touchably soft. Protect your skin with the Ultra-Light Hydrating Sunscreen Lotion SPF 50+. Suitable for all skin tones and types, the lightweight lotion shields skin from harmful UVA/UVB rays, as well as delivering sheer anti-oxidant protection. Ultra-resistant to water, the hydrating lotion allows you to enjoy a day outdoors without the worry. Cleansing Gel: Apply in the morning and/or evening to moistened face and/or body. Lather, rinse thoroughly and pat dry. 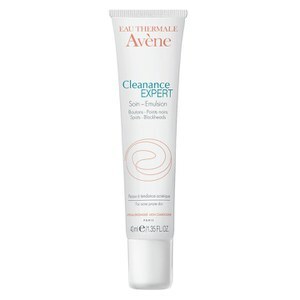 Expert: Apply morning and/or evening after thoroughly cleansing with Avène Cleanance Cleansing Gel. Toner: Shake before use. Apply morning and/or evening to the face with a cotton pad after thoroughly cleansing with Avène Cleanance Cleansing Gel. Sunscreen: Apply generously and evenly to face 15 minutes prior to sun exposure. Reapply every two hours or after 80 minutes of swimming or perspiring and immediately after towel drying. Cleansing Gel: Avène Thermal Spring Water, Water (Aqua), Sodium Lauroyl Methyl Isethionate, Zinc Coceth Sulfate, Polysorbate 20, Sodium Cocoamphoacetate, Ceteareth-60 Myristyl Glycol, Peg-40 Hydrogenated Castor Oil, Green 5 (Ci 61570), Citric Acid, Disodium Edta, Fragrance (Parfum), Glyceryl Laurate, Sodium Benzoate, Sodium Hydroxide, Sodium Sulfate, Yellow 5 (Ci 19140), Zinc Gluconate. Expert: Avène Thermal Spring Water (Avène Aqua). Isohexadecane. Propylene Glycol Dicaprylate/Dicaprate. Cetearyl Alcohol. Butylene Glycol. Dimethicone. Polymethyl Methacrylate. Glycerin. 1,2-Hexanediol. Algin. Butyrospermum Parkii (Shea) Butter (Butyrospermum Parkii Butter). Caprylyl Glycol. Caprylyl Glycol Linseedate. Carbomer. Cetearyl Glucoside. Dipotassium Phosphate. Disodium Edta. Disodium Phosphate. Fragrance (Parfum). Glyceryl Laurate. Papain. Polyacrylate-13. Polyisobutene. Polysorbate 20. Potassium Sorbate. Sodium Cetearyl Sulfate. Sodium Hydroxide. Sorbitan Isostearate. Water (Aqua). Toner: Avène Thermal Spring Water, Dipropylene Glycol, Sd Alcohol 39-C, Zinc Gluconate, Fragrance, Glyceryl Laurate, Peg-40 Hydrogenated Castor Oil, Ppg-26-Buteth-26, Salicylic Acid, Silica, Stearalkonium Hectorite, Triethanolamine, Water. Sunscreen: Active Ingredients: Avobenzone (3%), Homosalate (13%), Octisalate (5%), Octocrylene (10%) Inactive Ingredients: Water, Isononyl Isononanoate, Isododecane, Glycerin, Silica, Isohexadecane, Styrene/Acrylates Copolymer, Dimethicone, Polyester-7, Neopentyl Glycol Diheptanoate, Dicaprylyl Carbonate, Ethylhexyl Methoxycrylene, Polyester-8, Sorbitol, Arachidyl Glucoside, Tocopheryl Acetate, Arachidyl Alcohol, Behenyl Alcohol, Phenoxyethanol, Steareth-2, Ethylhexylglycerin, Xanthan Gum, Sorbitan Isostearate, Polyglyceryl-3 Distearate, Lecithin, Oleic Acid, Disodium Edta, Steareth-100, Mannan, P-Anisic Acid. Cleansing Gel: 3.3oz / Expert: 1.3oz / Toner: 0.84oz / Sunscreen: 0.1oz.